This Hooky Days event may be perfect for those gals who have a flexible schedule (ie: retired or self-directed) as it runs from a Sunday to Tuesday. This time of the season will offer a quieter atmosphere as it is not a week-end and we won’t be into summer holidays yet. Lazy days or the beach, a leisurely bike ride into Gimli, or exploring the easy hiking trails in the woods are all options. 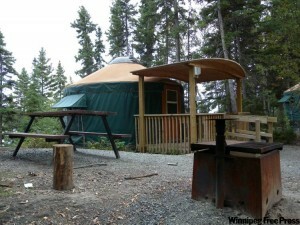 Have you ever camped in a yurt before? If you’re new to camping, this is the perfect introduction. It’s part cabin, part tent. 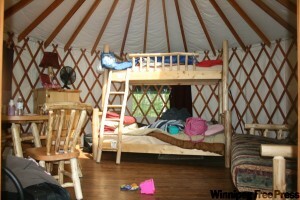 Much more spacious and secure than a tent, a yurt provides lots of head space, comfortable sleeping, and electricity. Each yurt has windows and a skylight that opens to let in fresh air and sunshine. A lockable door provides security and privacy. A heater and lighting are offered for your convenience. Your home-away-from-home also features rustic log furniture including a bunk bed, futon, table, chairs and small storage cabinet. Camp Morton is well located on the west shore of Lake Winnipeg just north of Gimli. Hiking, swimming, biking, and relaxing are all options. 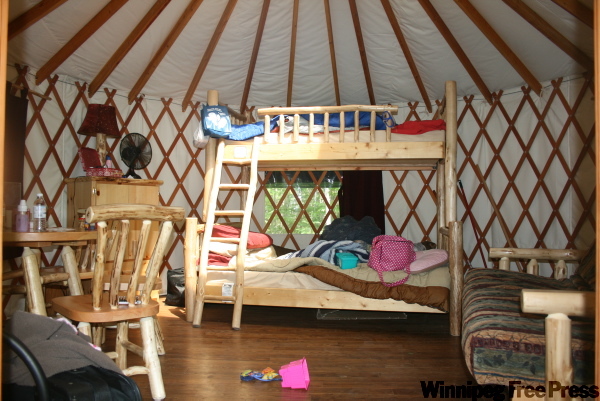 This Hooky Week-end is limited to 4 participants who will be required to share sleeping quarters in the yurt. Please be aware of your own comfort level with communal living. Non-modern washrooms (out houses) are within close proximity while moderm washrooms and coin-operated showers are witihn the campground. PRICE: $400 per person. $25 off if you book at least a month in advance. Maximum of 4 participants and a minimum of 2. Learn more about Hooky Days here. To register or if you have questions, please contact me. If you have your own group of people, family, friends, team, or co-workers that you think would benefit from a Hooky Day, please contact me so we can customized a day to suit your needs. You’ll be required to supply your own bedding. Cooking equipment and food will be supplied by me.